Bubble Blowing at its Best! With the rainy weather comes a great time to blow bubbles. Why? Because the humidity in the air keeps the bubbles wet longer, letting them float along in the breeze for a good distance. 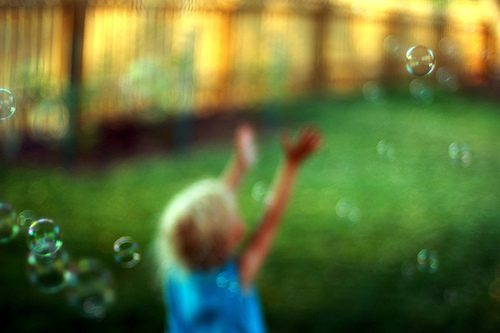 You don’t want to blow bubbles in the rain, but before or after a rain shower is a great time for long lasting bubbles. This is a great science experiment for you to try out with little kids when it is humid outside- Be sure to follow the directions for letting them sit out and age a little as mentioned at the end. Gently stir the ingredients together and leave the solution in an open container overnight. We believe that this gives the alcohol on the dishwashing soap a chance to evaporate some. In any case, the solution seems to get better with age. If you substitute some other soap for Joy, you will have to experiment with the rest of the formula… but that’s the fun of experimenting!